About two weeks ago Microsoft has made available the Windows 8 Consumer Preview for download, so that everyone interested can test the early preview version of the OS and now Nvidia has just released a full set of drivers for all of their GPUs. The just released GeForce Beta Driver 296.17 are available for both GeForce and Quadro GPU-based desktops and notebooks on Nvidia’s website as well as on Microsoft’s Windows Update. Windows 7, vista and Windows XP users aren’t left out either. 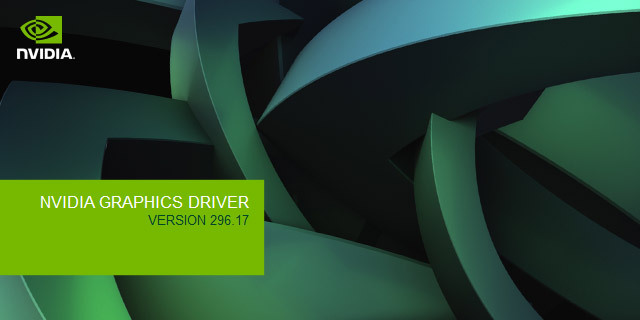 An equivalent driver, version 296.10 (WHQL-certified) is also available from today with it and the Windows 8 version being a quick refresh in terms of features and support from the recently released version GeForce 295.73 drivers. The new GeForce version 296.10 drivers add 3D Vision support for the following games: Dear Esther – Rated Good and Deep Black: Reloaded – Rated 3D Vision Ready. The new Nvidia Windows 8 video drivers support all the features of the new Windows Display Driver Model (WDDM) v1.2 and also support the 3D Vision and 3DTV Play products, allowing you to play more than 600 games, watch Blu-ray movies and view photos in 3D. With Windows 8’s new built-in stereoscopic 3D support in DirectX 11, 3D Vision is poised to provide users the best platform for games and applications according to Nvidia. What 3D Vision features are available right now on the Windows 8 Consumer Preview? Currently all fullscreen 3D Vision and 3DTV Play functionality is available on Windows 8 Consumer Preview. This include games, 3D Vision Photo Viewer, 3D Vision Video Player, and Blu-ray 3D. 3DVisionLive.com and 3D Vision window mode support will be available at a later date. I read that Windows 8 now natively supports stereoscopic 3D. What applications can I use to test that? I noticed Microsoft now has a stereoscopic 3D option on their display properties control panel. How do I enable 3D Vision on Windows 8 Consumer Preview? Please use the traditional NVIDIA Control Panel > Set up stereoscopic 3D options to enable 3D Vision and 3DTV Play. What 3D Vision features are enabled on Windows 8 Metro user interface? The current NVIDIA Windows 8 Consumer Preview drivers do not support these products. We are working on drivers to support these products later this year. The feature support will include 3D Vision Photo and Video Player applications and also 3D applications. Is NVIDIA 3D Vision Surround supported on Windows 8 Consumer Preview with the current 3D Vision drivers? Are “Optimized for GeForce” products such as glasses free 3D notebooks and passive 3D monitors supported on Windows 8? The current NVIDIA drivers for the Windows 8 Consumer Preview do not support these products. We are working on drivers to support these products later this year. Are 3D Vision DLP HDTVs 3DTV Play supported in the Windows 8 Consumer Preview? The current NVIDIA Windows 8 Consumer Preview drivers do not support these products. We are working on drivers to support these products later this year. I do not see a checkbox for stereoscopic 3D in the Microsoft Control Panel. How do I enable it in Windows 8? After a clean install of the NVIDIA drivers, please reboot the system and the checkbox should show up. I updated to Windows 8 and I can no longer play Blu-ray 3D movies. How can I fix this? Blu-ray 3D players – such as Cyberlink, Roxio, and ArcSoft – need to be updated to support Blu-ray 3D playback on Windows 8. Please consult your software manufacturer to ensure you are using a version that supports Windows 8.